Adobe Flash Player is the choice for both individuals and organizations when it comes to access the websites and play online games and videos. It is totally free to download and install on your Windows PC. This post will teach you How to update Adobe Flash Player. The plugin is free to download on your Windows PC. In order to update it, you need to check whether it is installed on your PC or not. Here, we are going to discuss steps to update Flash Player in chrome. Firstly, open the Chrome browser on your PC. Then, find the Adobe Flash Player. Further, click on the check for update option. If you observe the latest version of Flash Player then no need to update. Now, navigate to the page where Flash content option is available. if it does not redirect, click on the Reload option. 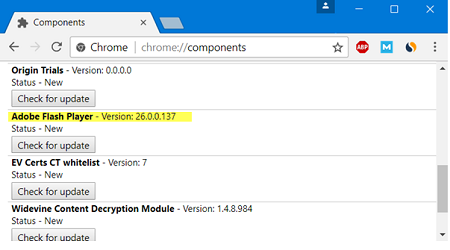 However, if you want to check the Adobe Flash Player version installed in the chrome then enter chrome://components in the address bar. It will show you the version and also ask you to ‘check for updates’. Further, for more information related to the flash player visit our website APKPie.